The other morning, my friend Sue showed me a photograph of a skull with cranial deformation in a book she was reading. She asked me which culture I thought it was from, and I answered, "Native American or possibly African." The book was Barbarians by Terry Jones and she pointed out that Huns were known for the practice, a fact new to us both. Well, an example has surfaced in a large necropolis discovered in the Alsace region of France. The 7.5-acre burial site contains 38 tombs that span more than 4,000 years, from the Stone Age to the Dark Ages. 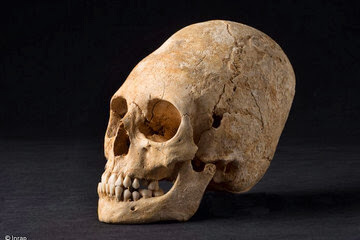 One area housed 18 tombs from either the late Roman period or the early Dark Ages (about 1,650 years ago), and one of the occupants was an aristocratic woman with a deformed, flattened forehead (IMAGE ABOVE, MORE IMAGES HERE). "The deformation of the skull with the help of bandages (narrow strips of cloth) and small boards is a practice coming from central Asia. It was popularized by the Huns and adopted by many German people. In France, Germany and eastern Europe, these deformed skulls appear in tombs rich in objects," explains archaeologist Philippe Lefranc of l’Institut national de recherches archéologiques préventives (Inrap). Evidence of the woman's wealth includes gold pins, belts known as chatelaines, pearls, a comb made of a stag antler, and a bronze mirror that likely came from the Caucasus region or central Asia. It is unlikely that this highborn woman would have put up with being called a "conehead."